Last night was the first “official” parent/player call-out meeting for the Starkville Storm Lacrosse Club. The board room at the Sportsplex was packed, and by the end of the evening, we had 14 high school boys and 2 high school girls on the roster. And our advertisement for last night’s meeting was a dismal failure. We have two more call-out meetings in November. We expect an even greater return once we actually get the word out in advance. US Lacrosse so very generously awarded us a First Stick grant which (in addition to many other benefits) supplies 24 sets of equipment this year and an additional 12 next year. That’s HUGE in this small town. Unbelievably huge. For families who have never seen a lacrosse stick in their lives, this gives them an opportunity to test the waters without making a substantial financial investment. The kids last night were already talking about camping out on equipment distribution day to ensure they got their goods. There’s a lot to this gig… grant writing, fundraising, equipment ordering, parent communications, etc., etc. It overwhelms me a bit if I think about it too long. But those kids last night? They were excited. You could feel it. And it wasn’t just because I said, “Hi! I’m Katrina.” (In the South, and in the brains of 15-year-old boys, there’s a great deal of sexual innuendo in my name, what with that infamous hurricane, the wind “blowing,” et al. If I need to give you more details than that, you’ve obviously let too much grass grow between you and your 15-year-old self.) I looked out at those snickering faces –a vast range of sizes, shapes, colors, and nationalities — and my heart was happy. Full. All y’all know I’ve been in a funk. I’m away from my home, out of my element, working a new job, having a pity party at least once a week. But it’s true what the ever-elusive “they” say… when you’re doing something for someone else, everything changes. When you open your hands to give, you receive more than you can ever imagine. I can’t wait to see these kids take the field. I can’t wait to pass out the shiny new helmets and sticks and watch them figure out how to cradle the ball. I can’t wait to line their sweaty, stinky selves up on the field and snap a picture of the newest team to hit Starkville. I’m so proud of Sam. This was his idea, his dream. His charming personality has opened many doors for us. He might be dicky in the morning, but when that kid sets his intention… watch out! (How does that old nursery rhyme go? “There was a little girl who had a little curl right in the middle of her forehead. When she was good, she was very, very good. But when she was bad, she was horrid.” Horrid in the morning, very, very good at life in general. That’s my kid.) My cup runneth over when I see him shaking hands, making introductions, making his dream a reality. And the rest of my kids? They’ve caught the fever, too. Gus has a renewed interest — an obsession, almost — in lacrosse. George has named himself the official team ball boy. Mary Claire is too distracted by One Direction to think about anything else right now. But our family is creating something new and different and beneficial for this town. Starkville, I’d like to introduce you to lacrosse. Lax, meet Starkville. I think you two are really gonna hit it off. 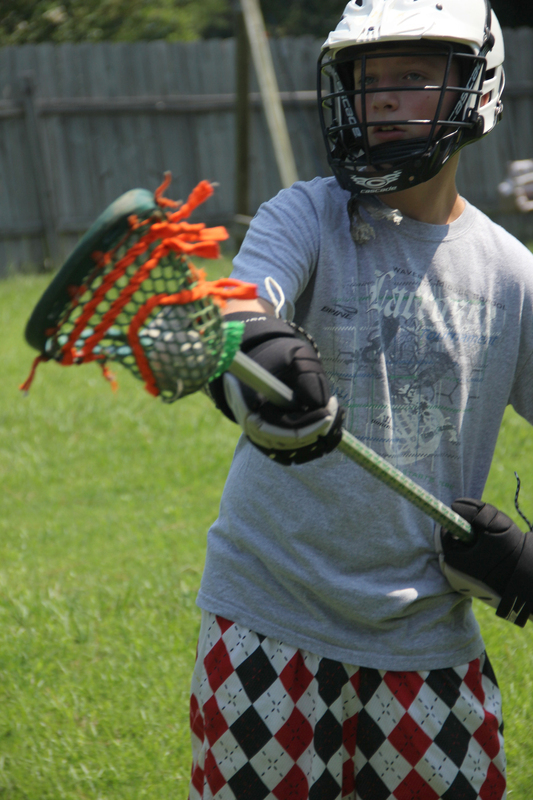 This entry was posted in My Kids and tagged First Stick grant, lacrosse, lax, Starkville lacrosse, Starkville Storm Lacrosse Club, US Lacrosse, US Lacrosse First Stick grant. Bookmark the permalink.